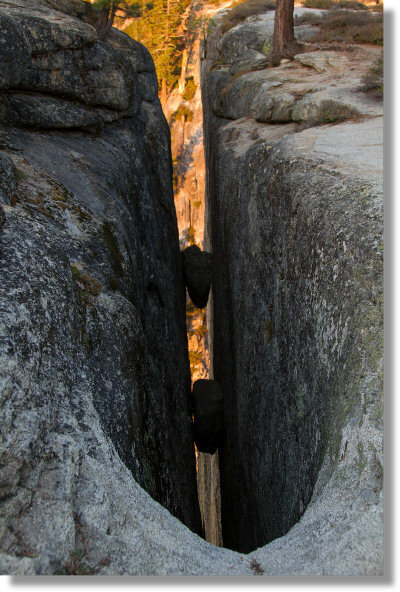 While Occam's Razor points to the Mothra hypothesis (see the main trail page), there are still geologists walking among us who believe that the fissures at Taft Point are joints - natural rock fractures separating rocks into two pieces that haven't slid apart yet. Geology Underfoot in Yosemite National Park devotes an entire chapter to the geology of Taft Point and discloses, among many other interesting things, that the Taft Point fissures are part of a much larger set of joints encompassing the face of Nevada Fall and the northwestern face of Half Dome, both some miles to the east. The book suggests that the joints may be part of a geologic fault, but notes that the official cause is still undetermined. Which, of course, means that Mothra is still in the running.